Well, finally, in March 2018, I got to experience this sensation, not just once but twice, and although the commentators weren’t quite so positive, coming down the hill on both occasions I thought we had a cracking chance of a winner. The first horse is Acey Milan, running for Owners for Owners and trained by Anthony Honeyball. He’d put in three excellent winning performances going into the Festival, including two Listed bumpers. Although 4yos don’t have the best of records in the Champion Bumper, he was all the rage on the day and was backed in to favourite, up against Ireland’s best from Willie Mullins and Gordon Elliott. There was a bit of an alarum when the horse jinxed going down to the start, giving Aidan Coleman a (thankfully) soft fall, but he managed to hold on to Acey Milan; there were no further mishaps. In the race itself one of the Mullins horses stole five lengths at the start and our horse cruised along behind him in 2nd or 3rd place. He tanked along coming down the hill and looked the winner swinging into the straight, but then lost his action a bit on the desperate ground and for a while looked as though he might fade out of contention, before putting his head down and battling himself into 4th place, with three Mullins horses ahead of us and one Elliott behind. There weren’t many British horses over the week capable of doing that, and indeed Acey Milan is probably the best bumper horse in this country by half a stone. He’s given all the owners a huge amount of fun this season and we’ve lots to look forward to next year, when he could easily shape up into a decent 2½ mile hurdler. I don’t think that I expected to have a similar excitement, albeit in a very different type of race. 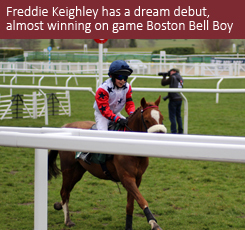 Martin and Belinda Keighley’s elder son Freddie, having turned 10, was eligible for his first Pony Club race, which duly happened at Cheltenham last Friday. Freddie and his 16yo pony, Boston Bell Boy (aka “Bubbles”), had been in serious training all year and the whole yard was looking forward to this debut with as much enthusiasm as for a horse running at the Festival. The Keighleys had their own support team at Cheltenham together with a number of key owners, and I have to say that the whole event was incredibly well organised. The young riders had to turn up at 10:00 am for a briefing and a walk of the course; they changed in the normal jockeys’ room, with Freddie hanging his clothes on the peg with Any Currency’s plaque on it; they weighed out on the same machine as the jockeys; were attired in racing silks (in Freddie’s case those of the Martin Keighley Racing Partnerships and Club); paraded before going down the walkway to the start, and then raced down the hill over seven furlongs on a well marked-out section of the course. The commentator picked up quickly that Freddie intended to race handily and within 100 yards he was already in the lead, with only two ponies in behind able to go with him. You probably know what’s coming …. He swung into the straight on the bridle, aimed straight for the stands-side running rail with Bubbles tanking along before hitting a flat spot, losing the lead but then staying on again under a great ride from Freddie to be beaten only half a length into second. A magnificent debut, and Freddie’s smile when he came in said absolutely everything. Once prizes had been received, the whole group repaired to The Hollow Bottom in Guiting Power for a lunch that carried through almost to dinner-time. A magnificent way to start Easter, and the Pony Club is a terrific way of training young jockeys of the future. Well done to all the organisers, and especially to Cheltenham for making it such a special day. Just one comment on the Festival, as we’re now a few weeks on from it. My biggest disappointment, as in the previous year, was the flagrant breaches of the whip rule. Either the rule has to be tightened up so that the jockeys are penalised far more severely, or the prescription of the number of times you are allowed to hit a horse has to be scrapped. Two of our trainers have seen their horses beaten by other riders, in effect, cheating. Last year Pendra in the 3m 2f Kim Muir for amateur riders was given an excellent ride by Derek O’Connor before Gina Andrews threw everything at her mount Doomsday Book, ignored the whip rule completely and got up to beat Pendra by ¾ l. If O’Connor had done the same, Pendra would have won. This year Ms Parfois, in the 4m National Hunt Challenge Cup for amateur riders, was only beaten ½ l by Rathvinden under an incredibly strong ride from Patrick Mullins. Again, Mullins ignored the whip rule whereas Ms Parfois’ rider Will Biddick stayed within the rules. While Ms Parfois didn’t help her chance with a mistake at the 2nd last, she might also have won. And then of course the Champion Jockey Richard Johnson did the same, winning the Gold Cup on Native River. A £6,000 fine is neither here nor there for Richard. In fact I felt that this was one of the rides of the decade and it really just flags up how poor the current whip rule is. It would be far better to allow local stewards complete discretion. 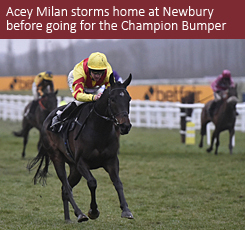 Aidan Coleman, on Acey Milan, gave our horse a typically fine and strong ride while staying within the rules. Young Freddie Keighley wasn’t even allowed to have a whip, but again gave his pony a fine ride. Surely the whip rule needs to change? Personally I hope this happens by the time of next year’s Festival. Here’s hoping that we have more runners at the Olympics of our sport. What an excitement March was. I hope I live long enough to see young Freddie come over the last and storm to success up the famous hill.